As Republicans seek to throw millions of Americans off insurance this week, progressives are, once again, playing defense. Activists are going full bore to stop the Cassidy-Graham bill, which is opposed by virtually every health organization of significance. The legislation, which grows more contemptible with each passing day, would lead to about 41,600 deaths a year, according to a report released yesterday by the Annals of Internal Medicine. Indeed, the GOP’s frightening efforts are a reminder why it is vital to have a movement for health care justice that seeks to end the commodification of health care, one way or another. The good news is that this movement is growing, as is evident from the fiery opposition to Trumpcare. And this movement is fueling growing momentum for single-payer health care, not only with Bernie Sanders’ Medicare for All bill, but also across the states. Passing a statewide plan has proven difficult, with recent efforts in several states either killed or stalled. These disappointments have been a source of frustration for advocates and cannon fodder for the for-profit health industry. It has become almost impossible to read a critique of single-payer without a talking point like: If it didn’t work in Vermont, how could it work anywhere? However, these arguments are deeply flawed and misrepresent not only the battle over statewide health care in Vermont, but also how single-payer works at any level. The failures to win universal care in Vermont and Colorado are indeed considerable setbacks. But do they reflect systemic reasons why a public, universal health care system is impossible? Is the fight for a statewide system under these principles dead? Not according to organizers, legislators and medical professionals in five states who spoke with Truthout. Despite setbacks, these organizers continue to advance the cause of health care justice. Their approaches include increased grassroots pressure (in California and New York), new policies which aim to build toward universal care one sector at a time (Vermont), and efforts to measure the impacts of single-payer in real time (Massachusetts) to better understand and educate stakeholders about the impacts of the policy. Once a state is able to pass a universal system, organizers hope, the benefits will become evidence for — and not against — creating a national health system. California’s battle for single-payer stalled when Assembly Leader Anthony Rendon shelved the bill, drawing ire of activists everywhere, including his own district. The CNA recently commissioned a study from GBA Strategies, which showed that that 41 percent of voters in Rendon’s district were “less likely” to vote for him in 2018 because he stopped the single-payer legislation. Activists across the country attacked him for all the money he has received from the for-profit health industry. Rendon, having received extensive blowback from his decision — including a recall effort — announced plans for hearings on universal health care. Rendon is not the only obstacle in California. Gov. Jerry Brown, a once-proud advocate of the policy as a presidential candidate, has lately been unsupportive at best after collecting hefty donations from the likes of UnitedHealth Group and Blue Cross Blue Shield. There are also complications due to California’s state legal process, which would likely require a ballot initiative to create single-payer, even if SB 562 was passed. Despite these setbacks, there are reasons for optimism. Unlike some smaller states, New York can collect substantial revenue from non-payroll taxes, such as taxes on financial speculation. Gavin Newsom, the current lieutenant governor, has promised to enact a universal health care program if he is wins the governorship in 2018. California’s legislative session runs on two-year timelines, which means the same bill can be voted on next year. Most importantly, people in California support the bill with increasing intensity. The large population of California also gives it advantages over small states in trying to pass reform. It is noteworthy that California’s population of 39 million is significantly larger than Taiwan’s (24 million), which successfully transitioned to single-payer in 1995 under a system designed by Harvard public health professor William Hsaio. Organizers in larger states say they have more options to finance single-payer, in contrast to Vermont. This is one reason why there is also nationally-recognized momentum behind New York’s reform efforts (the New York Health Act, or A.5062). Vermont’s proposal relied heavily on revenue from payroll taxes. In New York, however, the state can collect more revenue from non-payroll taxes such as profits from financial speculation, which are abundant in the financial capital of the world. Although single-payer still produces savings of up to 14 percent in that state, there are fewer opportunities to finance it, according to Hsaio. Vermont also has less “top end wealth” (or extremely rich people) than New York or California. There are just more than 15,000 millionaire households in Vermont as of 2015, according to Phoenix Marketing International, a sliver compared with New York (438,000) and California (773,000). Further, Vermont is one of only five states with no billionaires, according to Forbes, compared to 193 and 94 respectively in California and New York. Trump and Washington Republicans are headed in the opposite direction. But states have long been laboratories of democracy. Those larger states are home to a lot of taxable wealth that can help finance a health system with progressive taxation. Without it, more of the tax burden falls on the middle class. Larger states also have more bargaining power when dealing with drug companies, which increases savings on prescription drugs. These savings comprise one of the major arguments for of a single-payer system nationally. The New York Health Act, introduced each session by single-payer champion Assemblyman Richard Gottfried, has passed the assembly with ease. A study on the bill by economist Gerald Friedman concluded that 98 percent of New York households would spend less on health care under the act than they do now. The bill enjoys the support of the assembly and endorsements from a wide array of groups. Now, the challenge is the New York Senate, which is currently run by Republicans. The body is unique in that it is made up of 22 Democrats, 31 Republicans and nine members of a third, varied group of legislators called the Independent Democratic Caucus (IDC). The IDC, oddly, appear on the ballot as Democrats, but caucus with the Republicans, helping solidify the GOP majority. Surprising some, all IDC members have come out in favor of the New York Health Act, meaning advocates are one member away from having a majority of the body supporting the bill. The problem? The bill will never be voted on so long as the IDC members continue to caucus with the Republicans, keeping them in charge of the Senate. In New York, the Senate Majority Leader has no obligation to vote on an issue, even if the majority of the body supports it. “It’s nice that they are putting their names on the bill, but their partners in government are the ones with the power to prevent it from seeing the light of day,” said Sen. Michael Gianaris, deputy leader of the Democrats, to the Huffington Post. Gov. Andrew Cuomo recently expressed an openness toward single-payer, after the Sanders bill forced many Democrats off the fence. This was a surprise to many advocates in New York, as Cuomo’s administration has been mostly quiet on the issue. New York presents a complicated scenario, but Gottfried tells Truthout that with momentum on their side, activists will continue pushing until they find a way past the obstructions in the state senate. Indeed, what happened in Vermont was not a failure of policy, but of politics. With a once-supportive governor and an impressive grassroots campaign, the state passed Act 48. This initial structure was based on designs drawn up by Hsaio, the creator of the Taiwan’s system, who was commissioned by the state for this purpose. He concluded that a single-payer payer system could “immediately produce” savings of 8 to12 percent and then 12 to14 percent over time. However, on the heels of a close election, Shumlin and other top Democrats lost the courage to follow through, giving fodder to critics ever since. “The way Shumlin handled it, he really set the whole movement back nationally,” Friedman said. What happened in Vermont was not a failure of policy, but of politics. “This surrender is all the more remarkable because the Green Mountain People’s Republic is the ideal socialist laboratory,” observed The Wall Street Journal in an editorial celebrating the death of reform in Vermont. Yet this reading of the situation grossly misrepresents what happened, as PNHP founders Steffie Woolhander and David Himmelstien concluded in a report. It notes that Shumlin took cover by citing an inherently flawed economic analysis of the plan which counted costs, but not savings. “The report by his staff estimated zero administrative savings from its proposed plan. It also projected zero savings on drugs and medical devices,” Woolhander and Himmelstein said. Deb Richter, former president of PNHP and one of Vermont’s leading health care advocates, recognizes that, in the aftermath of the demise of Green Mountain Care, a new approach must be taken. Her idea is to push for a narrower first step: universal primary care. Richter’s hope is that this plan would be enacted with a long-term goal of reaching other sectors until, in time, every sector will be financed publicly. This is similar to how the Canadian universal health system was created. Richter is hoping the bill will be introduced in 2018, although many fear Gov. Phil Scott will veto the law, should it get that far. Vermonters are paying the “tax” of rising health insurance premiums, which is eating into their household budgets. The goal of providing care that would cost less and not result in any new taxes is a rather ambitious goal, especially given that Gibbs added that Vermont “cannot afford to experiment with ideas that are not mathematically verified to be the best path to universally affordable comprehensive care.” Not being open to new taxes — even if they reduce costs overall — indicates a lack of interest in shifting toward any kind of public health care. “Vermonters are paying the ‘tax’ of rising health insurance premiums, which is eating into their household budgets,” Richter told Truthout in response to Gibbs’ comment. She notes the administration’s criteria would rule out most Republican staples, such as high-risk pools, managed care and health savings accounts. “All of these have been tried and have not been shown to reduce system costs,” she said. A few hours away, in Massachusetts, organizers and legislators are trying to build momentum for single-payer legislation, as Truthout reported in June. 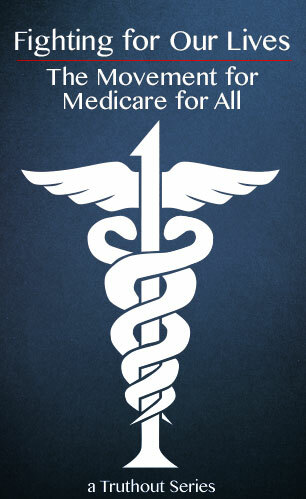 Hearings were held recently when two bills were introduced, including one that would create a single-payer system (S.619) in the state. The second bill is called the Act to Ensure Effective Health Care Cost Control, or S.610. Under this bill, the state’s nonpartisan Health Policy Commission, “an independent state agency” which “monitors the performance of the health care system,” would also measure the impact that single-payer would have on costs and delivery of care in Massachusetts. Should the proposal show savings after a three-year period, the legislature would have “a mandate to act,” according Ture Turnbell, the executive director of Mass-Care, a pro-single-payer group in the state. “Finland has same population and they are quite capable of managing on their own. Why can’t we do it?” Benson added. Why can’t we do it? This is the pressing question resonating around the country — and not just in the most “liberal” states. Organizers are asking this question in Nevada, where state lawmakers recently passed a “Medicaid for All” bill that was vetoed by the governor. The Nevada chapter of PNHP supports the bill, according to chapter chair Sean Lehmann, who said the legislation falls short of many advocates’ ultimate objectives but has helped organize people in the state. This organizing is now focused on stopping Trumpcare. The fight to block Trumpcare and the fight to advance single-payer health care go hand in hand. Recently, Sen. Jon Kennedy said he might adding an amendment to the Graham-Cassidy bill to ban state-based single-payer systems, although Sen. Lindsay Graham, sponsor of the bill, has largely dismissed that idea. Given the depths the Republicans have gone to ruin health care, however, you can’t rule anything out. This is why the movement for health care is growing, and why the work being done all across the country will be needed to be make health care a human right for all. Growing estrangement of labor from Democrats could lead to Shumlin’s replacement. The process of aging and dying should not be exploited for profit. Public pressure will be key to overcoming industry resistance.